The Telluride Power Transmission Company built a 35-mile line from Provo Canyon to the Mercur mining area. The line was put in service at 40kV, which was a world record. It was heralded as a great achievement: “a happy and fitting consummation of the high-tension tests” performed at Telluride CO. But trouble soon developed. The No.1 Provo insulator was only 7 in. diameter and was not up to prolonged service at such a high voltage. Interruptions to electrical power service ran as high as 14 per month. Within a year the mine at Mercur installed a steam engine and discontinued the use of electrical power. All failures were due to the line – some due to the insulators and some due to poor line construction. Pins, crossarms and even entire poles would burn to the ground during foggy weather. The affair was a devastating setback to the power industry as a whole. It did focus attention on the need to develop better insulators for higher voltage service. Mercur was the first of many high-visibility disasters caused by overconfidence in the insulator and lack of respect for the demands of high voltage. The Journal of Electricity called it "An inexcusable failure." The Telluride Company’s response to the disaster was to boil the pins in paraffin, treat the crossarms to exclude moisture and forbid the use of metal anywhere in the construction except for the copper wires. The all-wood approach worked until higher-voltage insulators were developed. 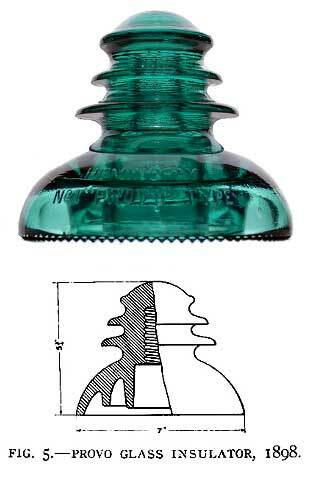 The Provo insulator itself was an excellent design when operated within its limits. It was used at 22kV throughout the American west.